I was fortunate to be invited to a special VIP Grand Opening Event of the very first Disney Baby store at the Americana at Brand in Glendale earlier today. It was an amazing event that not only showcased exclusive Disney Baby products but it honored military families with the biggest, and probably the only, baby shower at the Americana at Brand. Operation Shower is a non-profit that provides baby showers to service members and their families. 20 moms-to-be and new moms were given gifts and a $250 Disney Gift card and were the first the shop at the Disney Baby store. Disney Gift bag filled with goodies! It was a fun event with baby shower games, delicious food, and Disney Baby themed shower gifts. As a treat to Montebello Mom readers, you can enter to win something from my Disney Baby gift bag! The giveaway starts on Saturday, September 8, the same day Disney Baby has it's grand opening celebration. Books with a "Small World" theme. One is a cookbook featuring kid-friendly recipes from around the world. Small World themes board books for babies, complete with fuzzies and mirrors. The Illustrator of "It's a Small World", Joey Chou, autographed a book for my daughter. The book comes with a 13+ minute CD of the Small World song. It's a great version, starts with the ticking of the clock from the outside of the ride, has the gong of the clock, lots of instrumental like I've never heard it before. The full length song is like you'd hear on the ride. It's sung in different languages, includes the verse about the golden sun, and changes style as the song/ride travels from one culture to another. I'm listening to it now and can't help but imagine being on the ride. A must for any Small World fan! Kenny Loggins singing his famous "Return to Pooh Corner" song. So awesome! Basq, a new line of products for women. Cream for stretch marks, lotions, oils, great stuff. 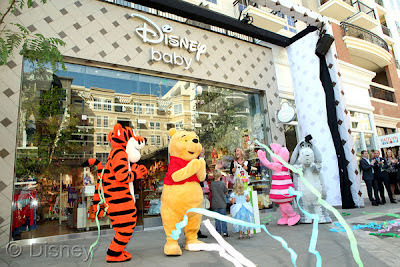 The reveal of the Disney Baby store! I love that Disney incorporated characters from a wide variety of movies. On top a plush from Aristocrats and on the left are Bambi and Boo bodysuits! Princess Bodysuit Costumes! Perfect for infants that love dressing up! Available in sizes 0-24 months. Section devoted to Mickey & Minnie. Anyone have boy/girl twins? For the little Cars fan in your house. I love Fisher Price Little People sets and I am in love with this Princess Songs Palace! It comes with Cinderella and Snow White. Belle/Beast, Ariel/Aurora, and Cinderella/Prince on their wedding day sets are sold separately. I couldn't resist. They were too cute! $7.50 for the newlyweds. Not just stuffed animals, they are Heirlooms! 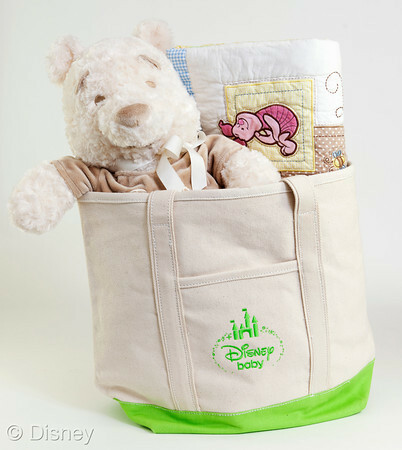 This edition of Disney baby products are in a neutral cream color and come with a keepsake bag for keeping it safe for the next round of babies. More Heirloom Edition plush, crib sets, and Vinylmation, "It's a Girl!" and "It's a Boy!" figures. Pajamas! The Disney Baby store carries clothing in 0-3months through 3T sizes. Hanging mobile decoration featuring the latest t-shirts. Bath time! Robes, towels, washcloths, tub toys. The mommy section! Complete with diaper bags, the Basq cream collection, and strollers! Here's something you don't see everyday, Eeyore walking down the street. Many of the products can be purchased at DisneyStore.com, right now enter code BABY15 and save 15% off of your purchase through September 23. 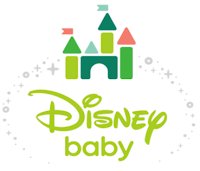 If you have young ones, it is worth your time to browse through DisneyBaby.com which is a website that helps parents plan for baby, shop, get advice & ideas, and share photos of your little ones!